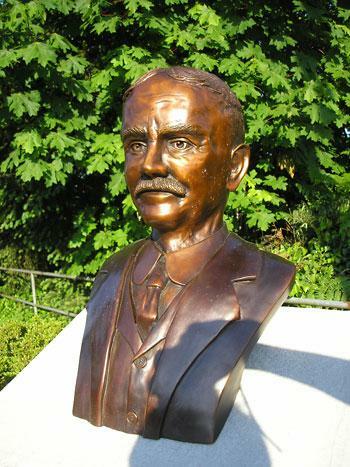 Tacoma Historical Society has facilitated a series of statues, monuments, and other public memorials of Tacoma history. Read below for more information about completed projects. Ira A. 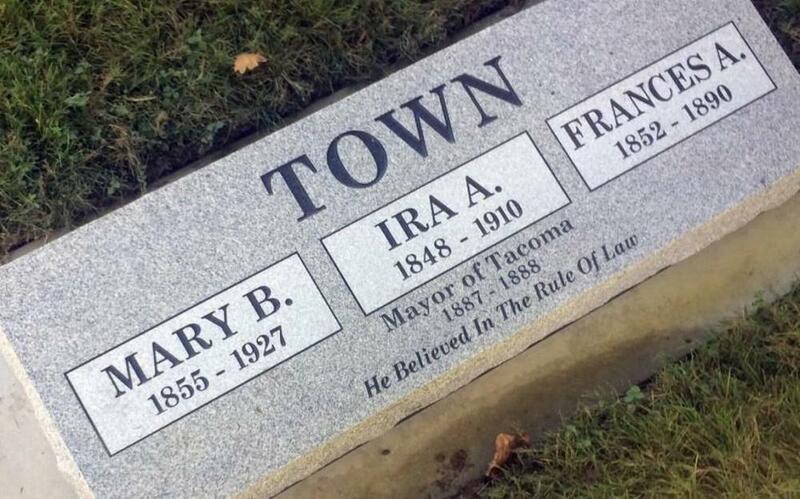 Town (1848-1910) served as mayor of Tacoma for one year, 1887-1888, bringing stability and the rule of law back to Tacoma following the Chinese Expulsion of 1885. 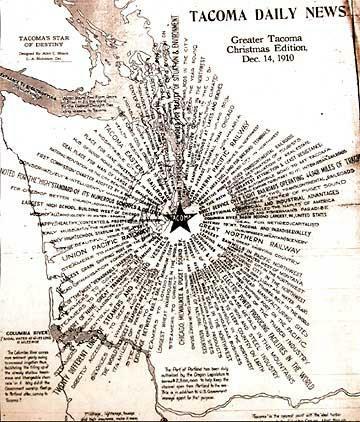 Town was buried at Tacoma Cemetery, but the site was not recognized with a headstone. When his descendants brought this to the attention of the Tacoma Historical Society in 2016, THS leadership decided to take on the project of providing a headstone for Town's grave. The South Tacoma Neighborhood Council gave a $1,000 grant, the Town family provided $1,000 and THS contributed $250, and the headstone was dedicated at a small ceremony on October 8, 2017. Now installed at North 51st and Winnifred Streets in Ruston, this bust honors William Ross Rust (1850-1928), who built the Tacoma Smelter into the giant enterprise remembered today. The Town of Ruston and Ruston Way are named for him. 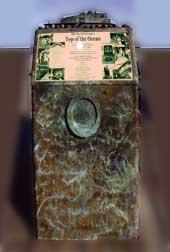 Paul R. Michaels was the sculptor; the late Babe Lehrer, fundraising chair; and Tacoma Historical Society, fiscal sponsor. 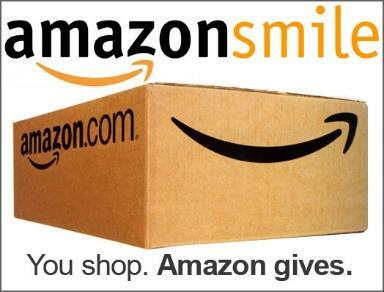 Donors included MultiCare, Point Ruston LLC, Margaret "Peggy" Rust Sheard, Helen Rust Watts, Carol Rust Paulick, Greater Tacoma Community Foundation and Ruston/Point Defiance Business District. Wren & Willow, general contractor, built and donated the pedestal. 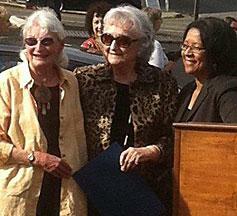 Sculptor Marilyn Mahoney, fund raising chair Babe Lehrer, and Tacoma Mayor Marilyn Strickland, at the unveiling. Photo by Dale Wirsing. It was a long and winding road, but Tacoma’s new Goddess of Commerce statue was dedicated in a celebration on Aug. 31, 2011, at 6th and St. Helens. Kudos to sculptor Marilyn Mahoney and organizer par excellence Babe Lehrer. Mahoney's statue is a modern interpretation of the one that stood atop the Chamber of Commerce Building dating to the 1880s. There were many fits and starts in arriving at a location, but now the goddess is a fixture of Tacoma's Theater District. Members of Stadium High School’s Junior Naval ROTC unit pose with the World War I Memorial Monument. Photo courtesy Andrew Kouklis. On Memorial Day 2011, a World War I Memorial was dedicated and presented to the memory of the 162 Pierce County residents who died in the war. The Memorial is located in War Memorial Park, just above Jackson Avenue at Highway 16. The Ben Gilbert Park project was promoted by the Theater District Association, a coalition of neighborhood residents, arts organizations, business and property owners in collaboration with the City of Tacoma Public Works Department, the Tacoma Water Department and Wm. Dickson Company. The park project demonstrates water conservation landscaping practices and crime prevention through environmental design. The Tacoma City Council formally named the park to honor Ben Gilbert on November 24, 2009. The mural project was created through an extensive neighborhood fund-raising campaign to promote the value of social and architectural heritage in this renaissance district. Ben Gilbert Park is named for a man who was dedicated to his community and ways to make it better. Aside from serving as an open space for office workers and residents representing the full spectrum of income demographics, the park is just a block’s walk for patrons of four theaters. The seat walls and benches, the flower boxes and landscaping, the unique pine trees, the historical lighting and brick pavers all contribute to an attractive setting. The crown jewel of facility is to be a photo reproduction on tile of an historic event that happened on this site nearly a century ago. On October 10, 1926, several thousand of Tacoma citizens swarmed across Ledger Square and everything surrounding the area to witness World Series results re-enacted on a large display board mounted on the Tacoma News Tribune & Ledger Building. This event was the seventh and deciding game between the Babe Ruth and Lou Gehrig-led New York Yankees and the St. Louis Cardinals. Ruth homered for the Yanks, but ended up being the goat, causing the last out by getting thrown out trying to steal second base, as St. Louis won the game 3-2 and the World Series - much to the delight of the pro-Cardinals Tacoma crowd. Eight weeks later, Ruth made a celebrity appearance at the Pantages Theater, which was located one block away at 9th and Broadway. Two side panels were installed next to the mural. One tells the story of the event captured in the 1926 photo and also describe the historical connections to the important buildings in the immediate sightlines of the park, including the YMCA, Medical Arts Building (now the Municipal Building), the Tribune & Ledger Building, Webster Apartments and rows of houses along Market Street. The second panel represents Ben Gilbert's important contributions to the city of Tacoma as a leader in the historic preservation movement that inspired downtown’s renaissance. Before coming to Tacoma, Ben was an accomplished newsman in Washington, D.C., serving as city editor at the Washington Post, then becoming an Emmy-award winning broadcast-news pioneer and advocate for the rights of the hearing-impaired . On the southeast corner of North 26th and Adams Street, next to Wheelock Library, stands a 100-year-old oak tree, a living reminder of Tacoma’s past. 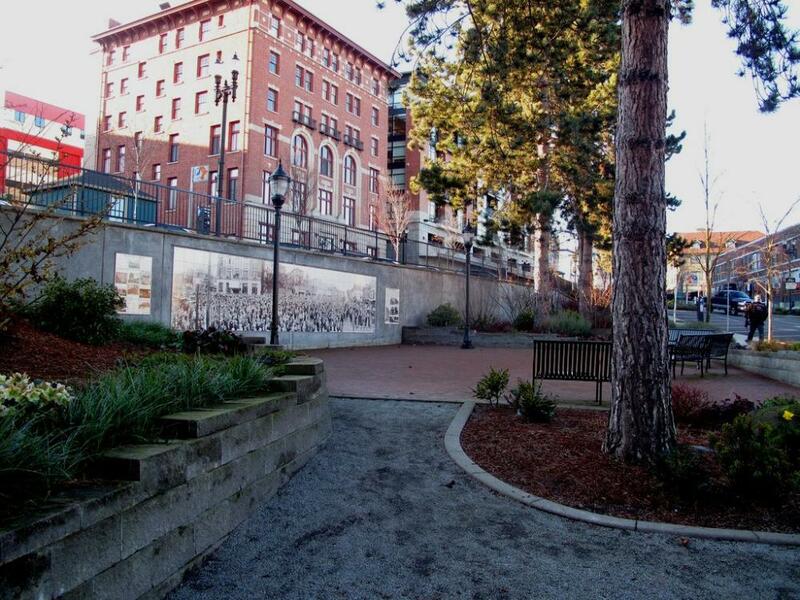 This is where Tacoma citizens built Mason Plaza. Built in memory of "Tacoma’s Best Salesman" Allen C. Mason, this gathering place - where one can come to read a book, share a story, or learn about Tacoma’s past - was realized through donations from throughout the community. 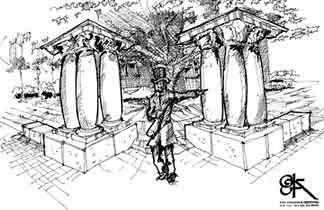 The space is framed by six grand sandstone columns, historic artifacts from Mason's own 1890's mansion. A 4-foot diameter bronze recreation of Mason's Star of Destiny is the plaza's centerpiece, and a statue of Mason himself, with hand extended in welcome, completes this focal point of civic pride. Tacoma Historical Society served as fiscal agent for this project, in partnership with Proctor District Association. The Top of the Ocean, an iconic restaurant built on pilings but looking like a boat, ruled the Tacoma waterfront 31 years - from its opening on Dec. 7, 1946, until it was destroyed by an arson fire April 3, 1977. Dedicated October 28, 2007, to those with fond memories of a unique gathering place. The monument is sited on the public dock next to the Silver Cloud Inn. The street address is 2217 Ruston Way. 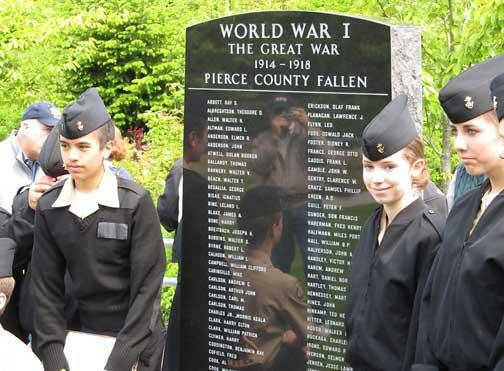 On Veterans Day 2007, a World War II Memorial was dedicated and presented in memory of the 760 Pierce County residents who died in the war. The Memorial is located in War Memorial Park, just above Jackson Avenue at Highway 16. The Memorial was built through the joint efforts of the Tacoma Historical Society and American Legion, Post 2. 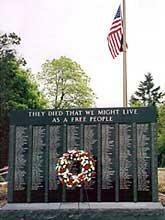 The memorial was funded by individuals, organizations, and foundations of Tacoma and Pierce County. 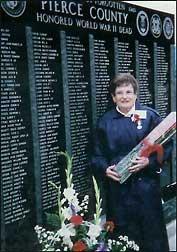 Board member, Charlotte "Polly" Medlock was instrumental in securing the funds and the city’s approval to allow the Memorial to be built in War Memorial Park. She was assisted in her efforts by Dr. Ronald Magden. For information on the service records of those whose names appear on this WWII Memorial, contact Mrs. Medlock at 253-752-7722 or the Northwest Room of Tacoma Public Library.